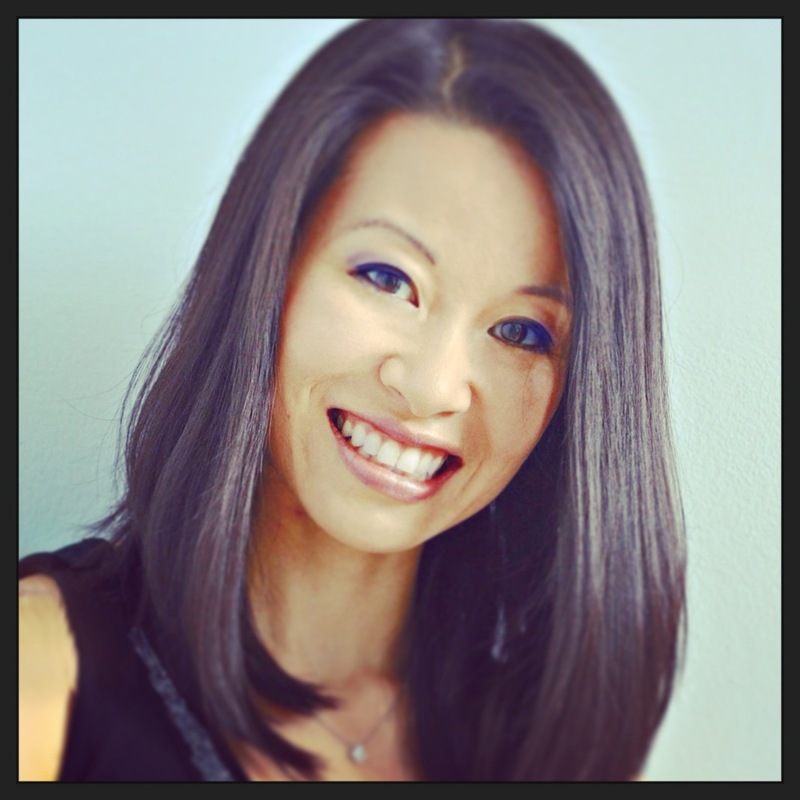 I am so excited to welcome Laura from Petite Allergy Treats. Laura creates all sorts of goodies that are always allergy conscious. 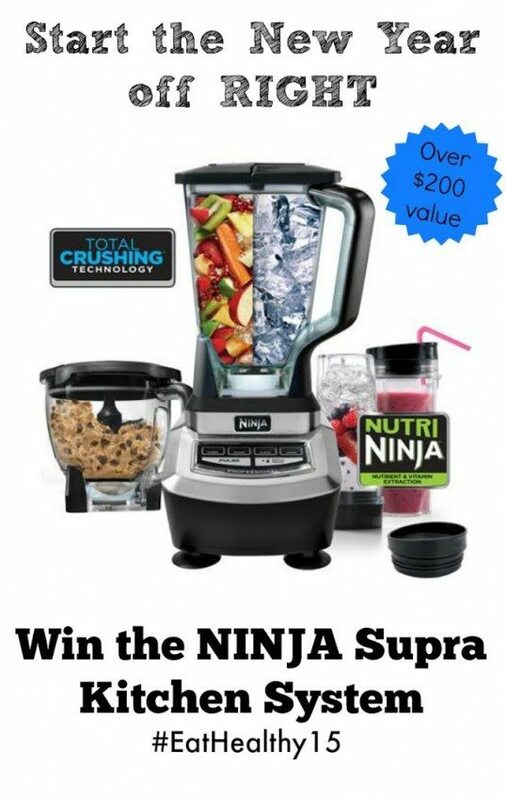 Be sure to stop by and enter to win the NINJA Supra Kitchen System that she is giving away! As well as check out Cupcakes & Kale Chips for some Healthy Desserts or Love Bakes Good Cakes for some Healthy Meal Ideas for our #EatHealthy15 Series. Hi there, it’s Laura from Petite Allergy Treats! Is it just me, or are you losing the will power to keep eating well and keep those New Years Resolutions? I mean really, the Super Bowl season is here and all those party foods are just too tempting… From dips to pizza or the brownies and cookies for dessert. 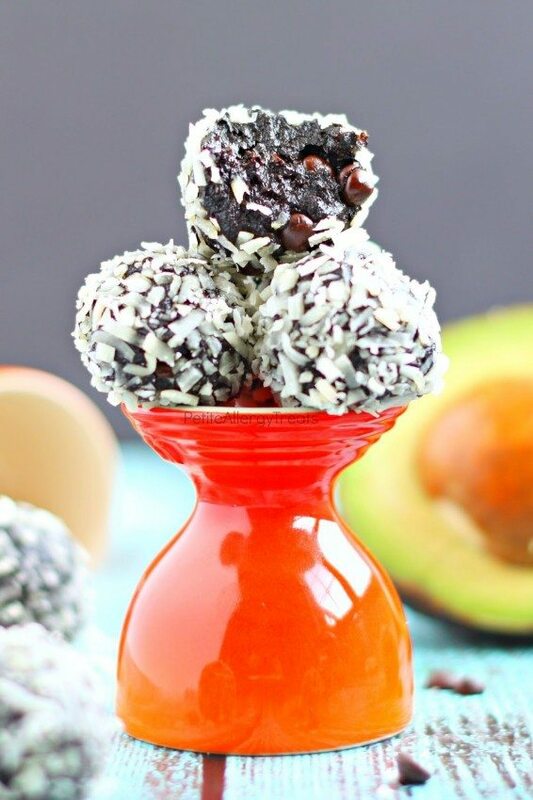 Luckily, I’m going to let you get your fix of rich chocolate and with these Healthy Chocolate Avocado Bliss Balls that are the perfect snack. It’s soo difficult to resist all the rich foods. And you know what? It’s all Nature’s fault. Think about it for a minute… We all know we should eat more fruits and vegetable and less high fat refined foods… But… Our brains are wired to crave rich calorically dense foods. So here’s a treat you can nibble on and feel satisfied with no guilt. 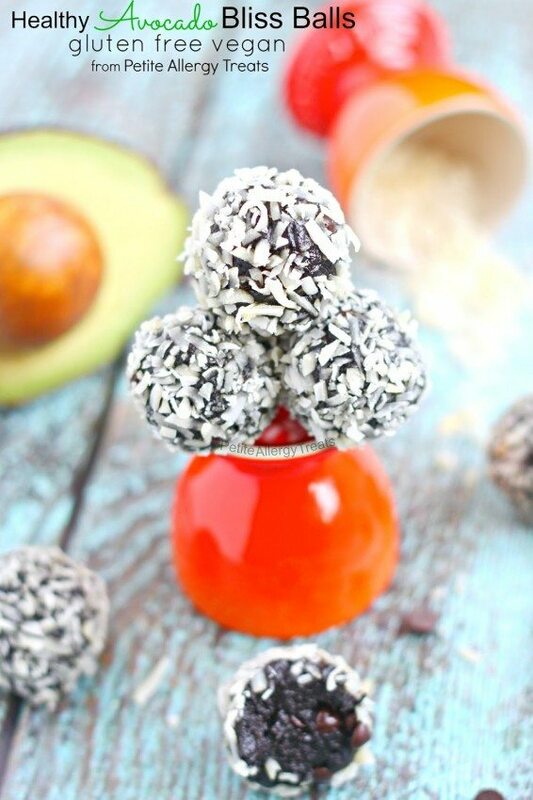 These little treats are made from avocados, which offer good monounsaturated fat and a bunch of potassium (twice the amount of bananas). The creamy texture works so well with chocolate too! 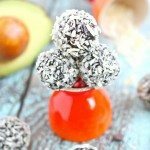 I’m a bit obsessed with using chocolate and avocado with my Chocolate Avocado Silk Pie and Chocolate Avocado Truffles. The prunes may sound a bit strange and have a reputation for, umm… other health benefits. Just think of them as giant sweet raisins. Add some cocoa powder and the rich decadent chocolately texture will trick your brain and into thinking it’s a fudgy brownie you’ve been dreaming of. If you don’t have a nut allergy, use peanut or almond butter to add some protein. My 2 boys are allergic to nuts so I used pumpkin seed butter instead. 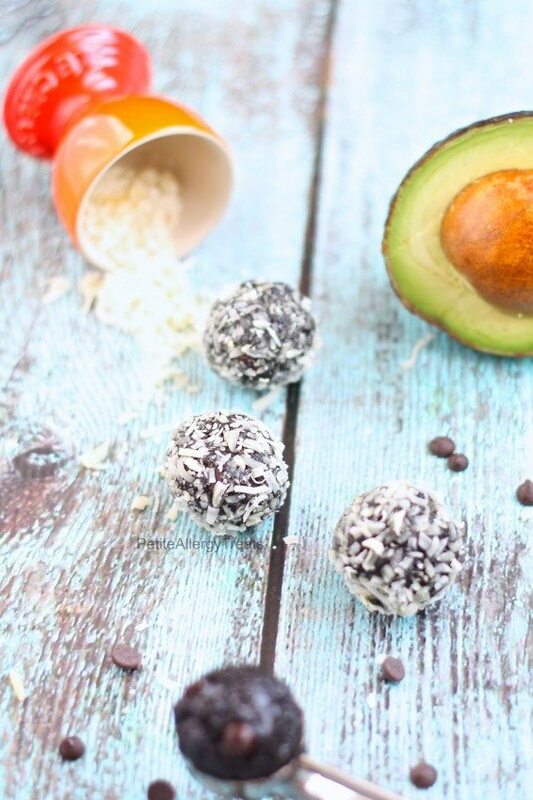 You can make these Avocado Bliss Balls with a Ninja Supra Kitchen System. I have one and love it! I used the food processor piece to make these. Enter to WIN here. Add prunes into a food processor and pulse until coarsely chopped. Add cocoa powder and nut butter. Scrape down sides periodically and puree until a a thick smooth dough forms. Mix in chips by hand and scoop into balls (I used a small cookie scoop). Laura is a mom of two boys with severe food allergies and creates nutritious recipes kids love despite all the dietary restrictions. 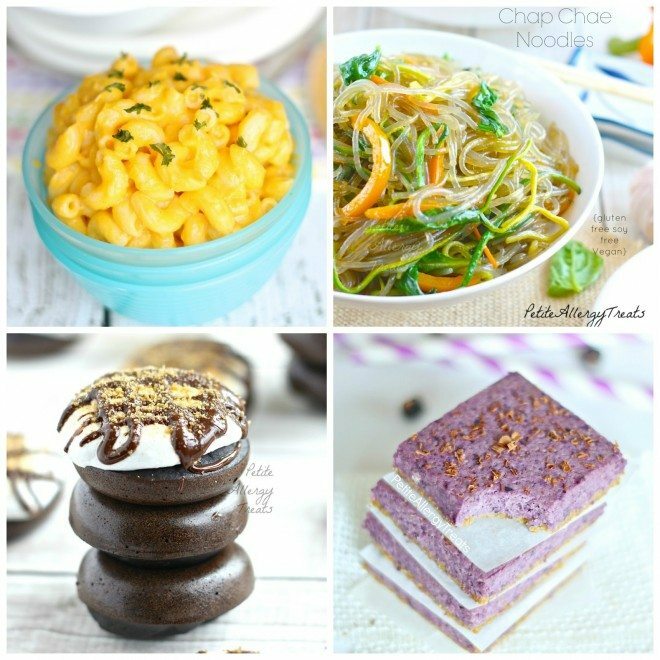 Please use her site as a resource for anyone you know with allergies to wheat, egg, soy, peanuts, tree nuts, seafood or dairy. Never tried Avocado with Chocolate. Sounds yummy!